Gastrointestinal stromal tumors (GIST) are the most common mesenchymal tumors found in the gastrointestinal (GI) tract, with the stomach being the most common site. They represent a distinct group of GI tumors originating from the interstitial cells of Cajal and are characterized by gain-of-function mutations of KIT. KIT oncoprotein serves as both diagnostic and therapeutic targets. Prognosis is related to size, mitotic activity, and site of the tumor. Asymptomatic, small endoscopic ultrasonography (EUS)-suspected GISTs are increasingly encountered with the wide availability of endoscopic/endosonographic examination. The majority of small GISTs are biologically indolent, albeit possibly harboring c-KIT gene mutations. An ongoing controversy exists regarding the management and surveillance policy for small gastric GISTs. A number of reports on the management of GISTs have been published, not confidently addressing the issue of gastric GISTs of small size. This work provides an overview on the current state of management considerations, specifically focusing on small EUS-suspected gastric GISTs, which are increasingly encountered by clinicians. Background and Objectives: Recent reports have indicated that the time of day may impact the detection rate of abnormal cytology on gynecologic cytology samples. The aim of this study was to determine if procedure time or queue position affected the performance characteristics of endoscopic ultrasound-guided fine-needle aspiration (EUS-FNA) for diagnosing solid pancreatic malignancies. Patients and Methods: We conducted a retrospective study evaluating patients with solid pancreatic lesions in whom EUS-FNA was performed. Three timing variables were evaluated as surrogate markers for endoscopist fatigue: Procedure start times, morning versus afternoon procedures, and endoscopy queue position. Statistical analyses were performed to determine whether the timing variables predicted performance characteristics of EUS-FNA. Results: We identified 609 patients (mean age: 65.8 years, 52.1% males) with solid pancreatic lesions who underwent EUS-FNA. The sensitivity of EUS-FNA was 100% for procedures that started at 7 AM while cases that started at 4 PM had a sensitivity of 81%. Using start time on a continuous scale, each elapsed hour was associated with a 1.9% decrease in EUS-FNA sensitivity (P = 0.003). Similarly, a 10% reduction in EUS-FNA sensitivity was detected between morning and afternoon procedures (92% vs. 82% respectively, P = 0.0006). A linear regression comparing the procedure start time and diagnostic accuracy revealed a decrease of approximately 1.7% in procedure accuracy for every hour later a procedure was started. A 16% reduction in EUS-FNA accuracy was detected between morning and afternoon procedures (100% vs. 84% respectively, P = 0.0009). When the queue position was assessed, a 2.4% reduction in accuracy was noted for each increase in the queue position (P = 0.013). Conclusion: Sensitivity and diagnostic accuracy of EUS-FNA for solid pancreatic lesions decline with progressively later EUS starting times and increasing numbers of procedures before a given EUS, potentially from endoscopist fatigue and cytotechnologist fatigue. Background: To develop and evaluate the feasibility of emerging interventions, animal models with accurate anatomical environment are required. Objectives: We aimed to establish a clinically relevant colorectal tumor model with canine transmissible venereal tumor (CTVT) utilizing endoscopic ultrasound (EUS) imaging guidance. Design: Survival study using a canine model. Setting: Endoscopic animal research laboratory at a tertiary cancer center. Materials and Methods: This study involved five canines. Interventions: A colorectal tumor model was established and evaluated in five canines under cyclosporine immune suppression. 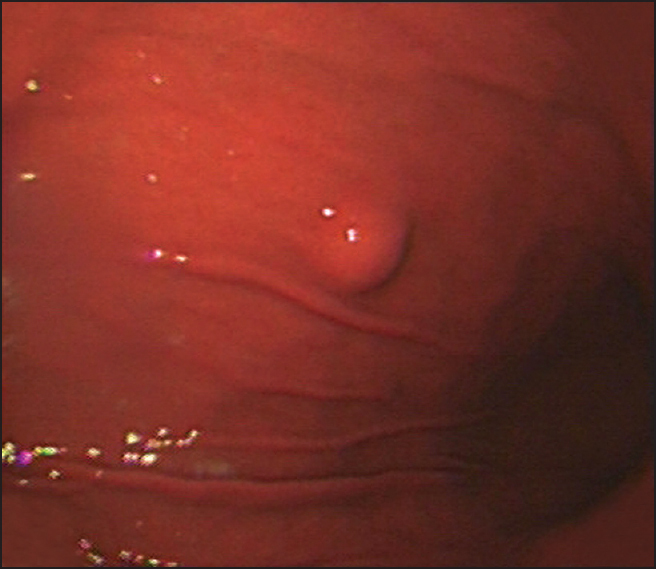 Under endoscopic imaging guidance, saline was injected into the submucosal layer forming a bleb. Subsequently, CTVT was inoculated into the bleb under EUS guidance. Endoscopy was the primary method of assessing tumor growth. Tumors developed in 60-130 days. Upon detection of lesions >1 cm, the animals were euthanized and the tumors were harvested for histopathological characterization. Main outcome measurements: Success rate of tumor growth. The presence or absence of vasculature inside tumors. Results: Colorectal tumor successfully developed in three out of the five animals (60%). Among the ones with tumor growth, average inoculated CTVT volume, incubation time, and tumor size was 1.8 cc, 65.7 days, and 2.0 cm, respectively. The two animals without tumor growth were observed for >100 days. In all the tumors, vascular structure was characterized with CD31 imunohistochemical stain. Limitations: Small number of animals. Conclusion: We succeeded in creating a new colorectal tumor canine model with CTVT utilizing EUS. 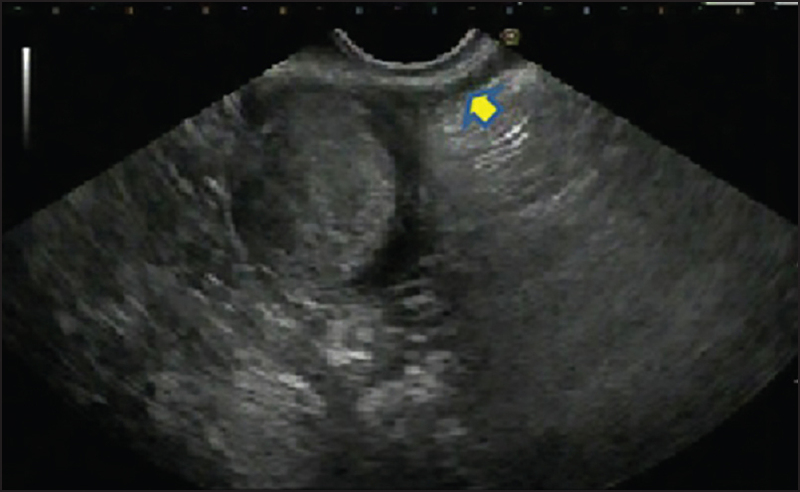 Aim: To reveal the impact of preoperative endoscopic ultrasound-guided fine needle aspiration (EUS-FNA) of pancreatic ductal adenocarcinoma (PDAC). Materials and Methods: We retrospectively reviewed 242 patients who underwent surgery for PDAC at our institution between January 1996 and July 2012. Among them, there were three patients with R2 resection and 30 patients with a follow-up period of less than 1 year, who were excluded because they did not meet the conditions for evaluating recurrence. Consequently, 209 patients were enrolled in the present study. The patients were divided into two groups: 126 patients who underwent preoperative EUS-FNA (FNA group) and 83 patients who did not (non-FNA group) undergo preoperative EUS-FNA. Results: There were no significant differences in baseline characteristics between FNA and non-FNA groups except mean age (66.6 ± 8.9 years vs. 63.5 ± 8.9 years, respectively, P = 0.02) and the administration rate of gemcitabine as adjuvant chemotherapy (42.9% vs. 18.1%, P < 0.01). Sampling adequacy of preoperative EUS-FNA was 99.2% (125/126) and sensitivity for diagnosis was 92.9% (117/126). The rate of complications related to EUS-FNA was 1.6% (2/126); two patients experienced reduction in hemoglobin (≥2.0 g/dL). These two patients did not have any apparent bleeding and could be managed conservatively. No severe complications were seen. We evaluated long-term outcomes of preoperative EUS-FNA, especially disease-free survival, needle-track seeding and recurrence. Kaplan-Meier analysis indicated no significant difference in disease-free survival between the two groups (P = 0.12). The site of recurrence was not significantly different between groups. Needle-track seeding was not observed in this study. Multivariate analysis of recurrence factors showed that preoperative EUS-FNA did not affect postoperative recurrence. 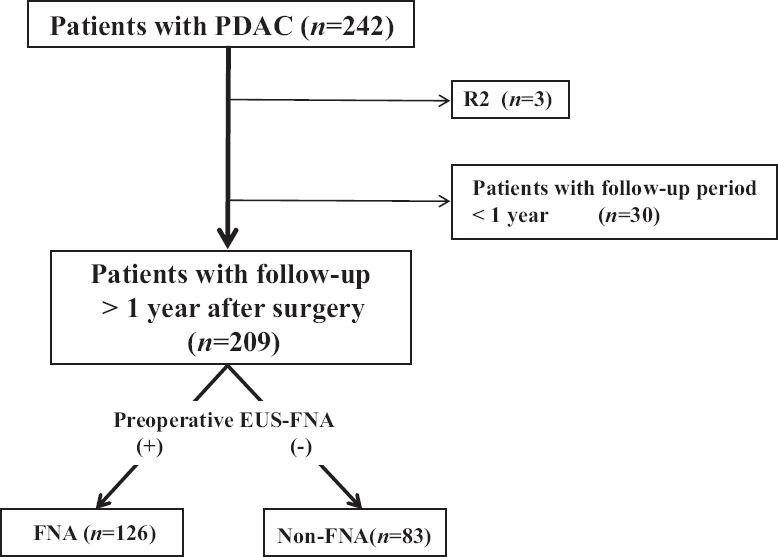 Conclusion: Preoperative EUS-FNA for PDAC was shown to be a safe procedure with high diagnostic ability, and not a risk factor for postoperative recurrence. Aim: The aim was to develop a high-performance computer-aided diagnosis (CAD) system with image processing and pattern recognition in diagnosing pancreatic cancer by using endosonography images. 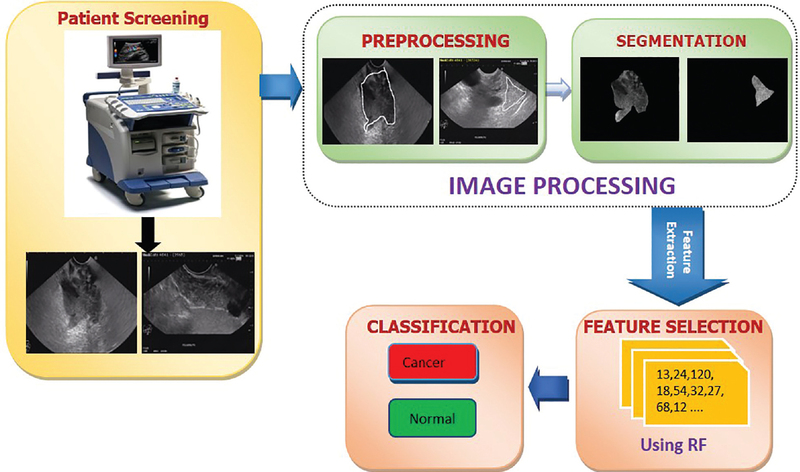 Materials and Methods: On the images, regions of interest (ROI) of three groups of patients (<40, 40-60 and >60) were extracted by experts; features were obtained from images using three different techniques and were trained separately for each age group with an Artificial Neural Network (ANN) to diagnose cancer. The study was conducted on endosonography images of 202 patients with pancreatic cancer and 130 noncancer patients. Results: 122 features were identified from the 332 endosonography images obtained in the study, and the 20 most appropriate features were selected by using the relief method. Images classified under three age groups (in years; <40, 40-60 and >60) were tested via 200 random tests and the following ratios were obtained in the classification: accuracy: 92%, 88.5%, and 91.7%, respectively; sensitivity: 87.5%, 85.7%, and 93.3%, respectively; and specificity: 94.1%, 91.7%, and 88.9%, respectively. When all the age groups were assessed together, the following values were obtained: accuracy: 87.5%, sensitivity: 83.3%, and specificity: 93.3%. Conclusions: It was observed that the CAD system developed in the study performed better in diagnosing pancreatic cancer images based on classification by patient age compared to diagnosis without classification. Therefore, it is imperative to take patient age into consideration to ensure higher performance. Background and Objective: Pelvic abscesses are a well-known complication of intestinal diseases or abdominal surgery. 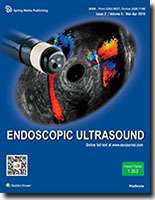 We report our case series concerning transrectal drainage by endoscopic ultrasound (EUS). Methods: Between January 2010 and august 2014, seven patients received transrectal drainage by endoscopic ultrasound (EUS) were selected and analyzed. Results: Two pigtails was positioned under fluoroscopic and EUS control. The success rate was 100% and complication rate was 0%. The median time of hospitalization was 10 days [range 4-25]. Conclusions: The technique appears to be safe and feasible in all etiologies. In our experience, we can considerate transrectal drainage by EUS like a first-line technique in experienced hands. Objective: To evaluate the diagnostic value of endoscopic ultrasonography (EUS) and contrast-enhanced harmonic (CEH) EUS in patients with gastrointestinal stromal tumors (GISTs). Patients and Methods: About 19 patients with suspected GISTs underwent EUS and CEH-EUS before tumor resection. The malignant potential was assessed according to the modified Fletcher classification system. Patients were divided into lower (Group I) and higher (Group II) malignant potential group. The clinical characteristics and EUS/CEH-EUS features were compared between two groups. Results: The tumor size in Group II was significantly larger than that in Group I (14.6 ± 5.8 mm vs. 32.1 ± 8.4 mm, P < 0.05). Heterogeneous echogenicity was observed in 4 (4/8) cases in Group II and none in Group I (P < 0.05). Irregular intratumoral vessels were detected in 6 cases in Group II and none in Group I (P < 0.05). The sensitivity and specificity of irregular vessel detection for discriminating higher from lower malignant potential GISTs were 75% and 100%, respectively. The positive predictive value and negative predictive value of detection of irregular vessels to high malignant potential GISTs were 33% and 100%, respectively. Conclusion: Detection of irregular intratumoral vessels can predict higher malignant potential before tumor resection. The tumor size and echogenicity are assistant factors for malignant potential assessment. Endoscopic resection is an efficacious treatment with good security for appropriate patients. Background and Objectives: There is a lack of consensus about the optimal noninvasive strategy for patients with suspected choledocholithiasis. Two previous systematic reviews used different methodologies not based on pretest probabilities that demonstrated no statistically significant difference between Endoscopic ultrasound (EUS) and magnetic resonance cholangiopancreatography (MRCP) for the detection of choledocholithiasis. In this article, we made a comparison of the diagnostic ability of EUS and MRCP to detect choledocholithiasis in suspected patients. 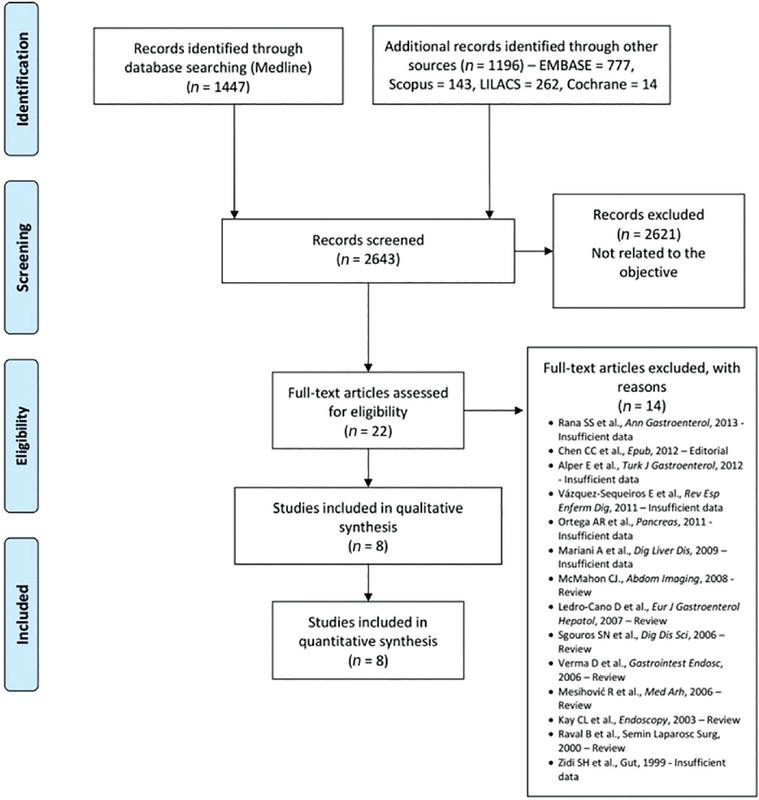 Methods: We conducted a systematic review in accordance with the Preferred Reporting Items for Systematic Reviews and Meta-Analyses (PRISMA) recommendations with all published randomized prospective trials. We performed the systemic review using MedLine, EMBASE, Cochrane, LILACS, and Scopus reviews through May 2015. We identified eight randomized, prospective, blinded trials comparing EUS and MRCP. All the patients were submitted to a gold standard method. We calculated the study-specific variables and performed analyses using aggregated variables such as sensitivity, specificity, prevalence, positive predictive value (PPV) and negative predictive value (NPV), and accuracy. Results: Five hundred and thirty eight patients were included in the analysis. The pretest probability for choledocholithiasis was 38.7. The mean sensitivity of EUS and MRCP for detection of choledocholithiasis was 93.7 and 83.5, respectively; the specificity was 88.5 and 91.5, respectively. Regarding EUS and MRCP, PPV was 89 and 87.8, respectively, and NPV was 96.9 and 87.8, respectively. The accuracy of EUS and MRCP was 93.3 and 89.7, respectively. Conclusions: For the same pretest probability of choledocholithiasis, EUS has higher posttest probability when the result is positive and a lower posttest probability when the result is negative compared with MRCP. 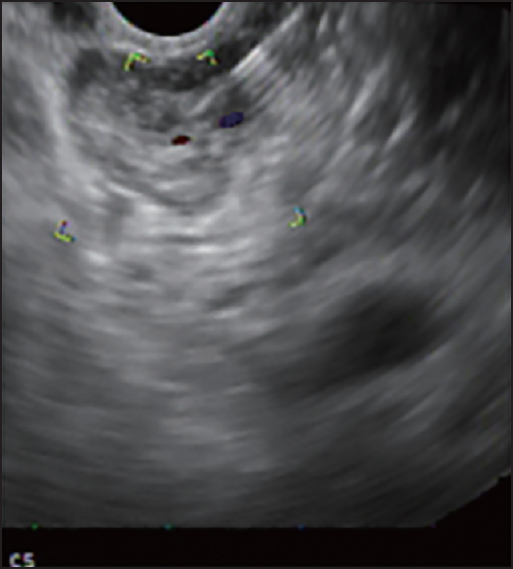 Endoscopic ultrasonography (EUS)-guided walled-off necrosis drainage using a double flanged metal stent was reported for satisfactory drainage and endoscopic necrosectomy. High complication rates related to stent migration are reported. This is the first report of the removal of a displaced, double flanged metal stent in walled-off necrosis by EUS. 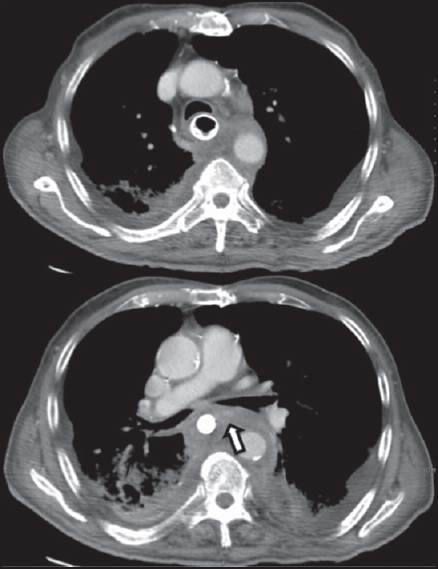 The patient was a 62-year-old male who was suffering from mild midepigastric abdominal pain. A double flanged metal stent had been placed in our endoscopy center 8 weeks before presentation. Computed tomography demonstrated complete resolution of the walled-off necrosis; however, the stent migrated into the cyst. We dislodged the stent using forceps with real-time endosonography. In conclusion, Follow-up is important for patients with a double flanged metal stent, specifically with regards to postprocedural stent migration. Plasmacytoma is a neoplastic production of a single line of plasma cells, usually forming monoclonal immunoglobulin. It most often occurs in the bone marrow; however, in 3% of the cases, solitary extramedullary plasmacytoma arises, which is a proliferation in the soft tissue, outside the bone marrow. In only 10% of the cases is the gastrointestinal tract involved. A 77-year-old female presented with lethargy, abdominal fullness, bilious vomiting, and clay-colored stools. The patient was anemic with initial laboratory results showing increased total and direct bilirubin with elevated transaminases. Despite conservative management, liver function tests (LFTs) continued to increase. 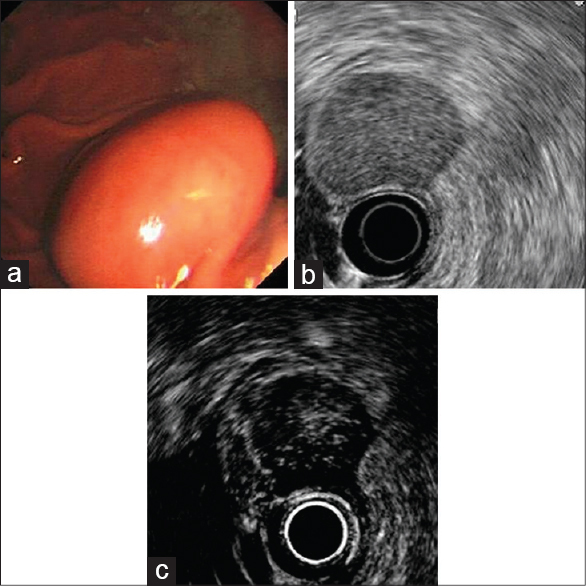 On endoscopic ultrasound (EUS), there was mild diffuse mucosal thickening consistent with possible infiltrative disease of the gastric body without any obvious focal lesions. There was a 1.7 cm Χ 1.8 cm hypoechoic heterogeneous lesion noted in the porta hepatis and fine needle aspiration (FNA) was performed. Cytology showed infiltrative plasma cells. 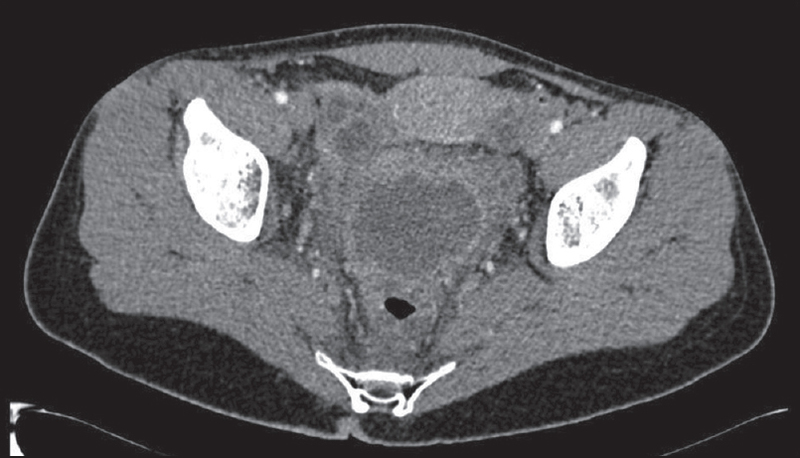 The patient was then taken for computed tomography (CT)-guided biopsy of the liver. Pathology showed liver involvement by atypical plasma cells in a nodular and sinusoidal pattern. Immunohistochemical staining appropriately identified the solitary extramedullary plasmacytoma. Plasma cell neoplasm is essentially a clonal disease of differentiated B-cells that can encompass a broad spectrum and present as asymptomatic monoclonal gammopathy of undetermined significance to plasma cell neoplasms or multiple myeloma. Five percent of patients with multiple myelomas are diagnosed with extramedullary plasmacytomas, and even less than that are diagnosed as a primary lesion. When the liver is affected, either as a direct diffuse neoplastic plasma cell infiltration, or as a single or multiple space occupying lesion as plasmacytomas, symptomatic features include extrahepatic biliary obstruction, jaundice, or ascites. In our case, the patient was diagnosed via EUS-guided FNA (EUS-FNA) bringing to light an alternative method to its diagnosis.